Left: Ignatius Chombo and Kudzanayi Chipanga, right. (file photo). Chombo is charged with breaching the Prevention of Corruption Act, criminal abuse of office and fraud. Magistrate Elisha Singano remanded the former minister in custody to December 8, determining that chances that he would abscond were high. "The accused had established contacts and connections which may prompt him to flee the jurisdiction of this court," the court ruled. "It's not disputed that our boarders are porous and people fled before. The seriousness and the sentence he is likely to face may also induce the accused to flee." Singano also said the fact that the public made an outcry demanding justice against the once powerful ruling Zanu PF party official weighed against him. The court said Chombo's life was at risk and his safety might be jeopardised if he was conditionally freed. Defence lawyer Lovemore Madhuku had argued for bail saying the State's case was incompetent. He said the authorities have been sitting on the charges for 12 years and it was not practical they would complete investigations in two weeks. Chombo's charges date backdate to 1997 with the latest offence allegedly committed in 2005. 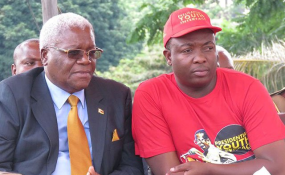 Madhuku had suggested that Chombo pays $2,000 as bail, report thrice a day to the police every day and surrender tittle deeds to his home among other things.